The recent and ongoing debate about the state of the U.S. academic workforce is, unfortunately, dominated by a number of aggressively asserted myths that have little basis in empirical evidence. In previous posts, I have debunked a number of these recurring claims including the “myth of the minimum wage adjunct” and the “myth of the 76% adjunct majority.” Though a number of irritated parties continue to assert otherwise, the statistical evidence against each of these myths is pretty much overwhelming. This same claim is similarly pervasive in media coverage of adjuncting, not to mention adjunct unionization advocacy. Yet like the other myths of adjuncting that I’ve examined in previous posts, this one is simply not true. The CFHE report similarly claims that universities have turned to “adjunctification” as a means of dealing with increased student enrollments. 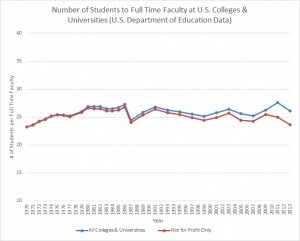 The adjunct activists assert that, instead of hiring new full time faculty, U.S. higher ed has absorbed the influx of students by hiring more part timers. This claim is equally specious. In reality, the ratio of students to full time faculty has remained remarkably stable since 1970. Both have grown at nearly identical rates, especially if you exclude the for-profit college industry. In 1970 the ration stood at 23.2 students per full time faculty. Today it stands at 26.08 students per full time faculty with for-profit colleges included, or 23.65 without. Allowing for normal fluctuations between 23 and 27, this ratio has remained almost perfectly constant between 1970 and the present day. Stated differently, student enrollments in 2013 stood at 2.37 times their 1970 level including for-profit colleges, and 2.19 times their 1970 levels when we only look at traditional not-for-profit colleges and universities. 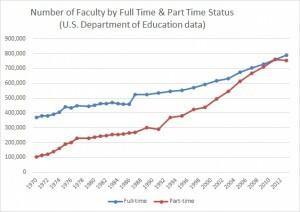 By comparison, the number of full time faculty today is 2.14 times its 1970 level. Full time faculty growth has virtually matched the growth in students. Why are Adjunct Positions Growing? Note that none of these factors decrease the number of full time positions, or “replace” full time faculty with adjuncts. 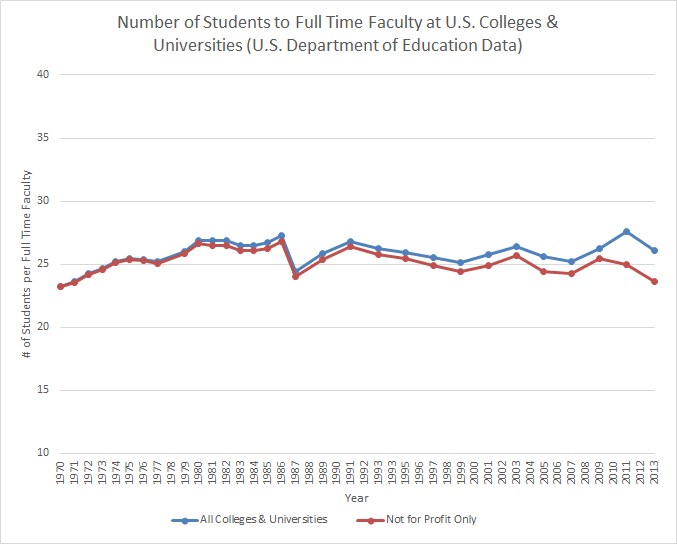 In reality, adjunctification (outside of the for-profit realm) simply reflects an expansion of university offerings even as the full time faculty core continues to grow at a stable rate that is at parity with the growth of the student body and has been for the past 40 years. 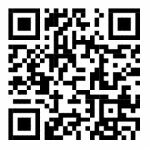 This entry was posted by Phillip W. Magness on Saturday, September 19th, 2015 at 11:41 am	and is filed under Uncategorized. You can follow any responses to this entry through the RSS 2.0 feed. Both comments and pings are currently closed.